We worked with St Francis Primary School to develop two key areas of their playground. They wanted to offer their children new and exciting physical challenges as well as creating a picturesque social area to encourage communication, language, outdoor reading and open discussions. One area included an old trim trail and climbing equipment that was no longer challenging for the children, as it only focused on balance, stability and lower body strength. The other area was simply an unused part of their playing field which had the potential to be transformed into something special. 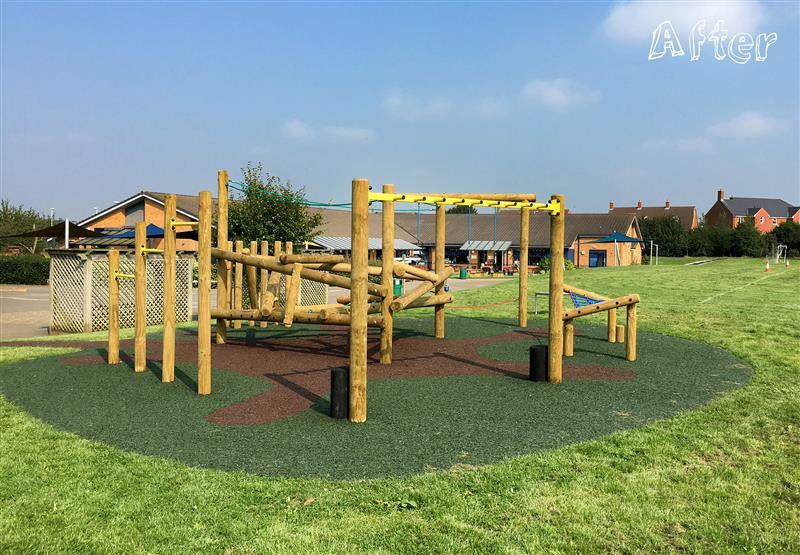 To create a more exciting area for physical development, we installed our Great Gable Climber and some exciting Trim Trail challenges. These new climbing challenges will help develop children's upper and lower body strength as well as grip strength, coordination, balance, stability, movement and gross motor skills. The climbing challenges are open-ended and accessible from all angles, giving the children no obvious way to enter or exit the area. With the combination of the playground equipment, the challenge becomes a group one, encouraging cooperation, competition, and imaginative play. 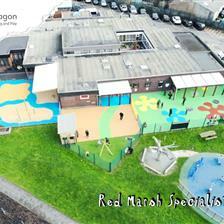 To make the area safe and accessible in all weather conditions, we installed our impact absorbing Playbond surfacing. Climbing Poles - A great way to build children's climbing confidence and test their foot and hand placement. Rope Swing Traverse – Improves hand strength, foot placement, balance and lower body strength. Monkey Bars – The children now have an upper body challenge which will also teach them about momentum. Pulls Up Bars – Great for body strength and friendly competition. Twist Net Bridge – Perfect for children’s stability and lower body strength. 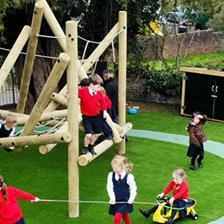 Great Gable Climber - An open-ended climbing frame that encourages both physical and imaginative play. We also installed our Double-Sided Timber Climbing Wall to develop the children's fine motor skills, grip, hand strength and flexibility. Groups of children will enjoy racing each other to the other side. 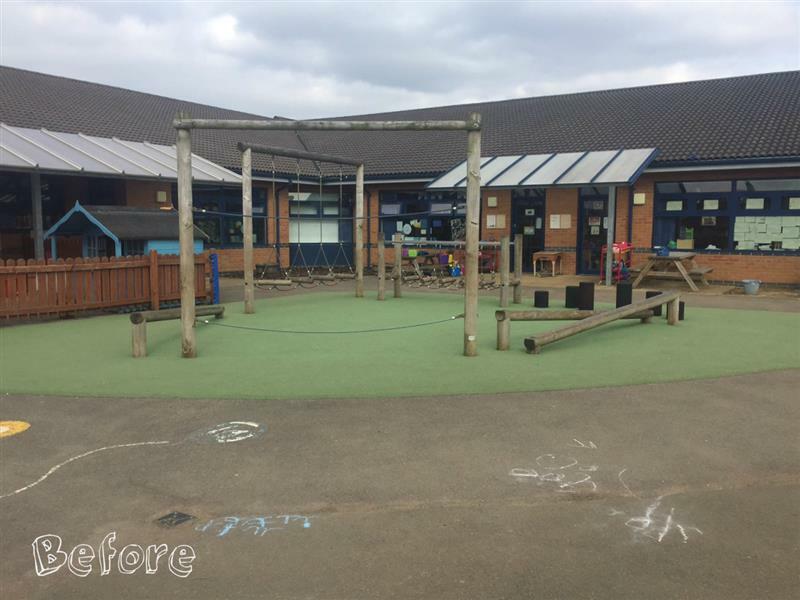 Due to the children having a new active play zone, we removed the school's old trim trail equipment and transformed the space into a charming outdoor social setting. We created this inviting and spacious area by installing our natural looking Playturf (Artificial Grass) over the top of the concrete. After, we added Perch Benches, Rubber Stepping Logs and Moveable Artificial Grass-Topped Seats to offer the children different seating arrangements. This gives the children their own little island in the middle of the concrete playground. 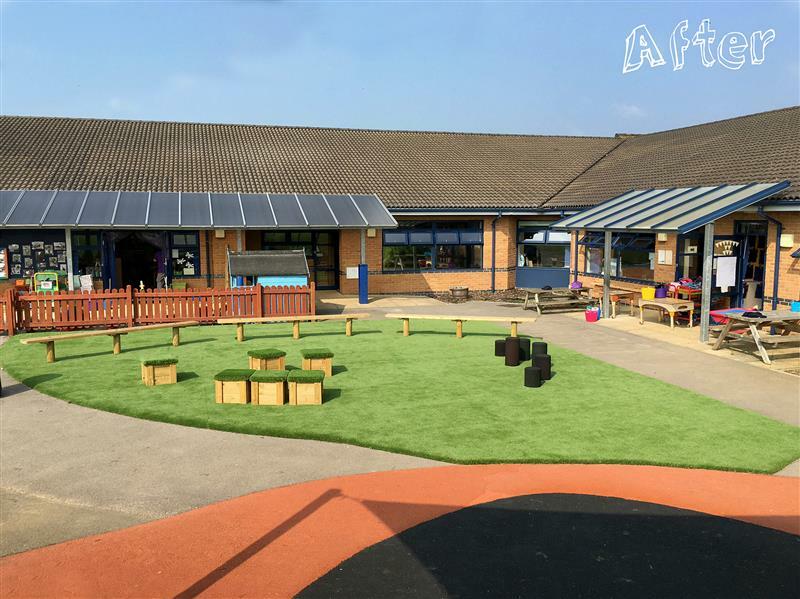 The area is designed to encourage interaction, develop friendships, improve communication and provide the children with a place for outdoor reading and writing. Teachers can also take advantage of the space when looking to take their lessons outside. Becky Fullarton the schools Outside Environment Coordinator had this to say about the overall process and working alongside Pentagon. "While working with Pentagon Play, we have been very impressed by their commitment, communication and professionalism throughout. Although we had some clear ideas about how we wanted to develop two of our outside areas, Pentagon were excellent by sharing their creativity and advice with us". 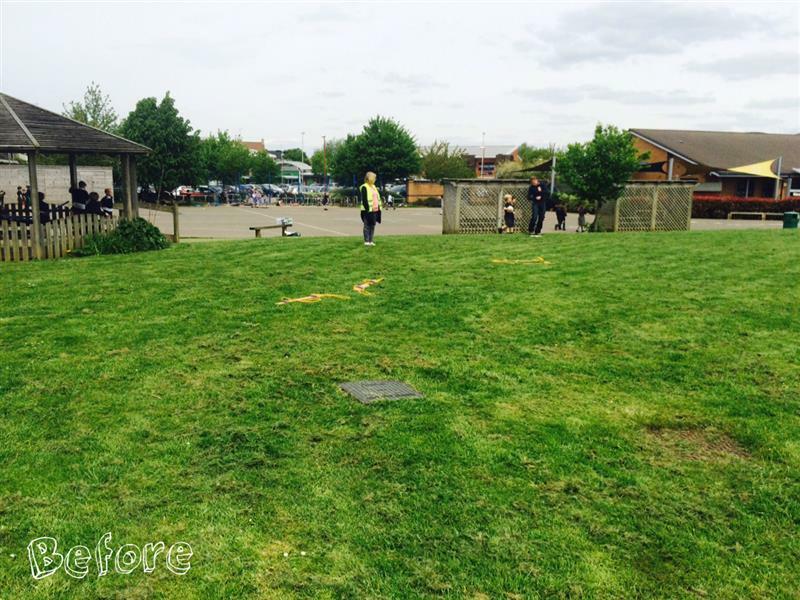 "By working together, we have created two fantastic areas that will benefit all the children in our school". "The new trim trail has added a much-needed physical challenge for Key Stage 1 and 2 children, proving very popular with all". "The new seating area, has had such positive feedback from children, parents and staff. It is fabulous for the children to have somewhere welcoming to play with their friends, to read a book, to watch a performance or to sit and have a chat! 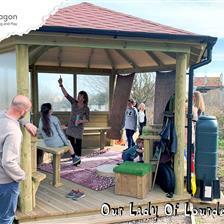 It has now added a new outside learning environment that is used by Early Years and Key Stage 1 classes. This has great potential for supporting children’s learning, giving them a space to perform, dance, sing, write, talk, read and play". "Thank you very much to all at Pentagon Play for their hard work to create such inspiring environments for us". Are you looking for some inspiration for your school playground? Simply fill out our Contact Form or give us a call on either 01625 890 330 (North Office) or 0117 379 0899 (South Office) to book a FREE consultation.